Bruce Willis & Demi Moore must be very proud. Bruce was banging Demi before Ashton, and that makes Bruce somehow a father-figure to Ashton? I have an easier time seeing Elmo as Winston Churchill. Gee Ashton, so glad that Steve was born and was successful just so YOU can have meaning! After all, that’s what it is all about right? I met a neighbour who lives up the street, I swear he’s channelling Jobs, uncanny! 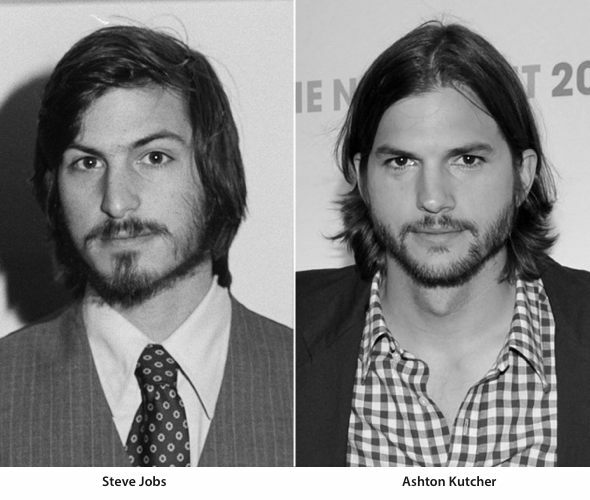 I look at the pictures and I remember that Ashton Kutcher dropped out of MIT to become an actor and Steve dropped out of community college to become a billionaire and I see that the parallels are just astounding. How do you put in an end of sarcasm tag again? No he did not go to MIT. He may have visited the gift shop, but he was not enrolled. Ashton Kutcher will be good. Look forward to it. I just hope to Jobs they film it in 3D! So the director can shove a Classic Mac in our faces. That makes all the difference. Whether you like him or you don’t, at least he is taking the roll seriously. Reserve judgment until you see the movie. What a fraud Ashton F Kusher is. I too could put on along hair and grow a beard and say I look uncannily like SJ. So could a million other people. But if you look at the features closely, you will find the are nothing like Steve’s.